If you've never touched a sewing machine or haven't been applying your machine sewing skills for a very long while while, then join this class and get a refresher or learn from scratch how to successfully thread a machine and all the way to building your skills through a whole variety of sewing projects. By the end of the course, you will have made your first steps into dressmaking and completed a few pieces of your own! 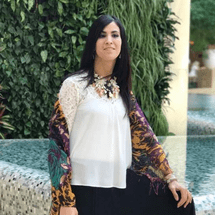 Your instructor and professional fashion designer, Bouchra, will give hands-on instruction and tips to make you able to use the sewing machine like a pro. "Great instructor, I learnt a lot in few sessions. "